These beautiful words do my heart a world of good. They make the work worthwhile. *** You can order your own copy of my new PDF book, Tarot Circle Encounters by sending $7 to circleways@yahoo.ca . I’ll email you the book. Easy! My new book is ready for YOU! 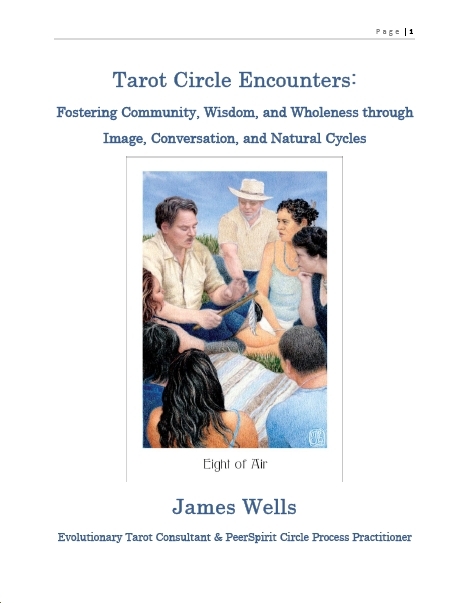 My new book, Tarot Circle Encounters: Fostering Community, Wisdom, and Wholeness Through Image, Conversation, and Natural Cycles, is written and for sale. It’s a PDF book, so the price is very reasonable, only $7. It contains 12 experiences, rooted in nature, that blend the tried-and-true symbolic beauty of the tarot with the conscious conversational process of circle process. It also teaches you the basic of circle-based conversations and provides you with reflective questions to harvest the wisdom of your tarot circle experiences with friends and peers. The prompts for each tarot circle are designed to take you deeper into your own Knowing so you become more self-aware and are stimulated to take simple positive action in the real world. Simply send $7 to circleways@yahoo.ca through PayPal and I’ll email you your copy of this groundbreaking book. Please join me in my enthusiasm for the birth of this new project. C. The quotations and my paraphrase of them teach me that the trumps are symbols of common inner states and outer experiences, a visual reassurance that nobody is alone in anything, whether celebratory or difficult.